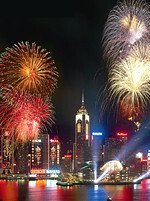 About Hong Kong: A unique blend of East and West, nonstop energy and excitement. Shimmering skyscrapers cast shadows over century-old shop houses. And minutes away from the city's hustle and bustle are jungle-covered peaks, fishing villages, and monasteries. Hong Kong also means shopping -- the bargains are everywhere. Climate: Hong Kong is an all-year-round destination, although the most popular time to visit is from the middle of September to the end of February, when the weather is cooler. At its coolest (mid-December to February), the temperature averages 59°F; at its warmest (late May to mid-September), it averages 82°F but may reach 91°F. Documents: Visitors from most countries can enter Hong Kong without a visa for periods of 7 days to 6 months, depending on nationality. U.S. and Canadian citizens. Electricity: Voltage in Hong Kong is 220 volts, so a transformer will be needed to operate 100-volt appliances. Most major hotels provide hair dryers and other amenities. Taxes and Tipping: Hong Kong charges an airport tax. Here, it is HK$50 (about US$6.40) for travellers aged 12 years and older. Most restaurants will levy a 10 per cent service charge, but will expect to be given some loose change. Restaurants that don't add a service charge will expect a 10 per cent tip. However, the tipping is left to your discretion. Bellboys, porters, restroom attendants and taxi drivers will happily accept loose change. Time: 8 hours ahead of Greewich Mean Time (+8 GMT). Daylight Saving Time is not observed. Languages: The English is very widely spoken. There will be no problems in communicating with people in most hotels, restaurants and even some taxis.